I’ve loved Alice’s Adventures in Wonderland and Alice Through the Looking Glass since I first read them. I’m all about words, and Lewis Carroll’s language is tastier than most. 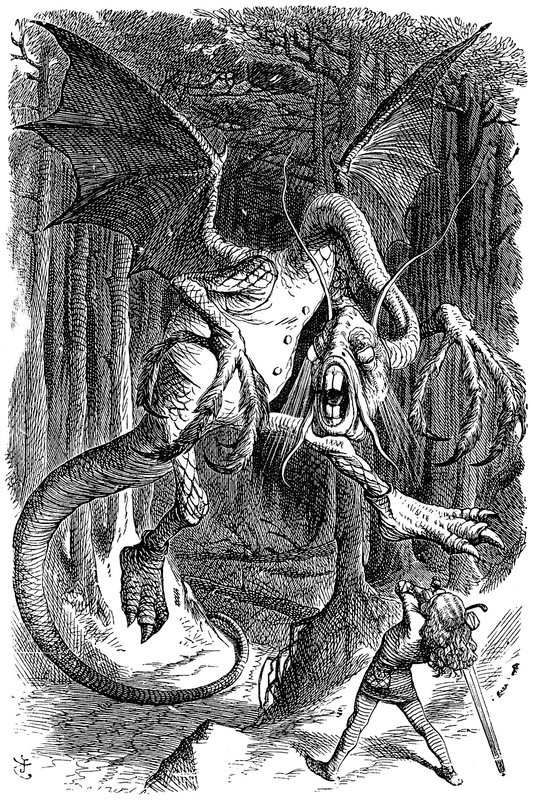 Introducing Jabberwocky to a group of kids is so fun – helping them recognize what words might mean with context clues, using the rhymes to determine pronunciation, and explaining the term portmanteau. Carroll’s Humpty Dumpty defines it as “two meanings packed up in one word, and kids are usually quick to grasp the inherent Carrollian logic of flimsy + miserable = mimsy. Listen to Christopher Lee – Saruman himself! – read you Jabberwocky on YouTube. Click here for books about Carroll at TBPL, or here to place your hold on an annotated Alice’s Adventures in Wonderland.